Want To Pick Up Some Great Quilting Skills? 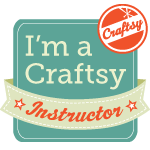 …then zip on over to the big sale that Craftsy is having this weekend! You’ll be able to learn all kinds of quilting techniques at your own pace, by your own schedule! Many classes are 50% off during the sale over this Columbus Day weekend. Click here to link to the sale prices for many great classes!